Maj. Gen. Otema Awany during a function in Atiak Sub-county Amuru District on Sunday September 3. Phot by Irene Abalo Otto. 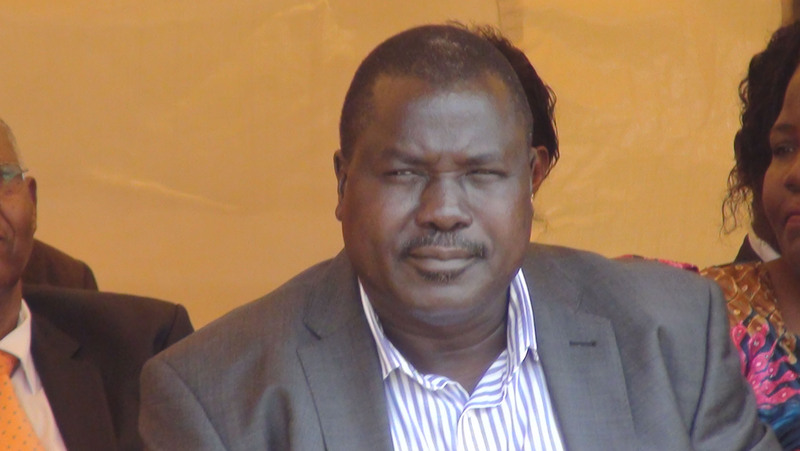 As the fall-out from wrangling over land in Acholi sub-region continues, an army general has dragged two Acholi MPs, an activist and a media outlet in Gulu for alleged defamation. In the civil suit filed on July 14 in the High Court of Gulu, Maj. Gen. Otema Awany names Simon Oyet (Nwoya MP); Gilbert Olanya (Kilak South MP)l; Richard Jomeo and Gulu FM Co. Ltd. He is seeking a permanent injunction against the trio, general damages and costs. The officer’s action follow statements allegedly made by the respondents when they appeared on a popular political talk show, ‘Wii Bye’ on Gulu Fm on May 3. Olanya told PML Daily that he was served with the court summons on Thursday last week. “Right now as I speak, we have got a court summon against four of us. I am telling you that matter was brought before Parliament and the minister gave a comprehensive report [which] showed that a soldier protecting Maj. Gen. Otema Awany shot and killed one Ocama and he apologised to the whole nation, saying the matter will be handled,” Olanya said. “Stop grabbing our land because you have guns. Stop grabbing land of an individual using your gun. We shall continue reporting you to the president,” he said. 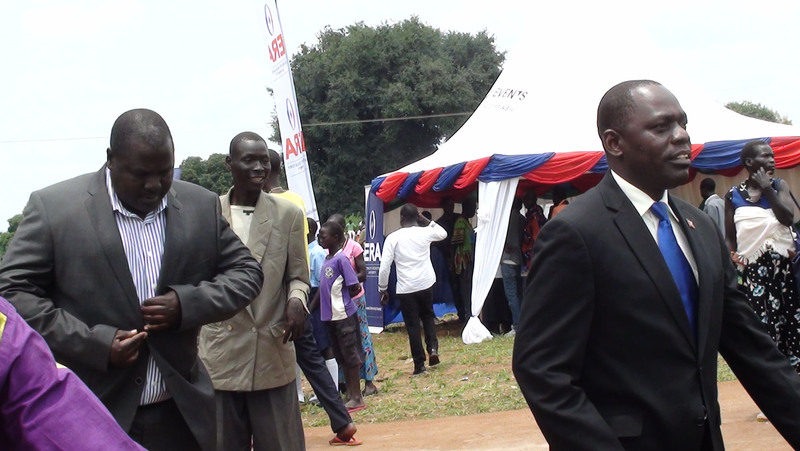 Maj. Gen. Otema Awany walks behind Kilak South MP, Gilbert Olanya at the same function on September 3 in Atiak. Photo by Irene Abalo Otto. Oyet told PML Daily that he became aware of the summonses through social media. “We are ready to defend ourselves. You can kill the body but you can never kill information. It’s very easy to kill Simon Oyet but the spirit and information will continue to live,” Oyet said. Meanwhile, Jomeo says that he has been receiving life threatening calls on his cell phone. He thinks this could be connected to his role in the Amuru land saga that has already seen several people lose their lives and property. The government’s controversial push to get 10,000 hectares of land in Amuru handed over to Madhvani Sugar Works for sugar cane growing is at the heart of an ongoing conflict pitting locals, politicians and church leaders against the state. “My courage of doing right and doing justice is being threatened. As a citizen of Uganda, I don’t need to have personal security. It is a constitutional mandate enshrined in our Constitution that the state must protect its citizens. Me as a citizen and a tax payer, I must feel free to enjoy the privilege and inherent right as a citizen,” Jomeo said. Bosco Otim, the Regional Police Commander for Aswa region, says no case of threats have been registered by either Jomeo or any politician in the case. He advised that all citizens must be conscious of their own security before police comes in to protect their lives and property. Maj. Gen. Awany is the commander of the Reserve Forces. He has served in the army for over 30 years, is a businessman, hotelier and commercial farmer.